We all want free WiFi. Karma comes pretty close. Karma's innovative social bandwidth model allows you to earn a lot of free data while on a strict pay-as-you-go plan. No hidden fees, no contracts. Now, Lifehacker readers can get one of the best mobile hotspots for $69 – an early Black Friday steal. Gizmodo's review of Karma was quite positive, giving it a Gizrank of 4/5. In fact, Karma has since fixed the only negative they listed (required Facebook integration – now it's optional). 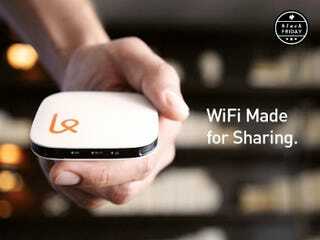 Built around the idea of "Social Bandwidth," your Karma hotspot broadcasts a secure but "open" network. Every time someone new connects to your Karma, both of you earn 100 MB of free data. You also carry your data with you – usable on anyone's Karma device. Karma is a pretty amazing service because they're totally transparent. No hidden fees or tricks for WiFi that fits in your pocket. Simply put – You pay for the data you use [$14/GB], when you want to use it. That's it. $14 may seem pricey, but in the context of using it when traveling, and all the free data, it's a good deal.